Memphis Air National Guard Base aims to be world class organization responding to the challenges of the 21st Century. It is home to the 164th Airlift Wing which began in 1946! 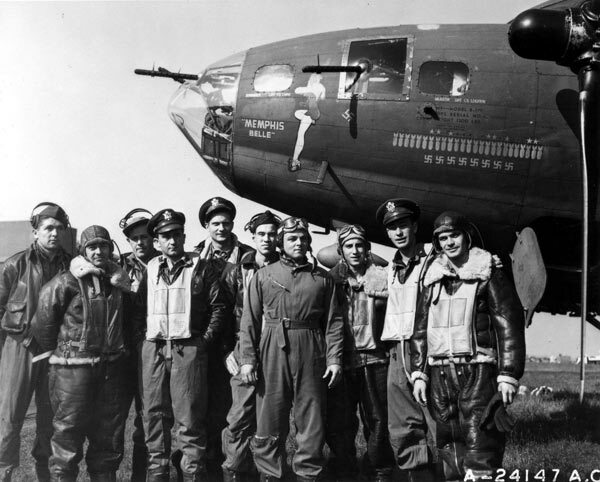 Read below to find out the history of the Memphis Belle. The 164th Airlift Wing began in 1946 when the secretary of war authorized the adjutant general of Tennessee to organize an air unit of the National Guard in Memphis. After months of planning and negotiating with local, state, and federal governments, the 155th Fighter Squadron obtained federal recognition on 23 December 1946 along with the following support units: the Utility Flight of the 155 FS, Detachment B, 218th Air Service Group, and the 155th Weather Station. Total personnel authorized to these four units were 50 officers, 33 of which were pilots, and 303 enlisted. Lieutenant Colonel Henry K. Crawley of Memphis was named the squadron’s first commander. The first Army Air Corps liaison officer (advisor) to the unit was another Memphian, Lt. Col. Fred Hook. In many respects, Colonel Hook was arguably the most instrumental figure in obtaining authority to organize an ANG flying unit in Memphis and securing facilities for the unit at Memphis airport. The 155th’s first organizational meeting (drill) was held Friday, 29 November 1946 at 1900. Excitement over the prospect of a new ANG flying unit in Memphis had been building steadily during the last four months of 1946. Local newspapers kept Mid-Southerners up-to-speed on developments regarding progress that was being made towards attaining federal recognition. The Memphis unit had no designation or assigned mission, but organizers were both enthusiastic and diligent in their actions to recruit personnel for their future mission. In the early months of 1947, with federal recognition securely in hand but still no aircraft, speculation surrounding the future mission was ramped. Two of the more popular rumors involved P-47 Thunderbolts and P-80 jet fighters. In the Spring of 1947 the speculation would be put to an end as the famed P-51D Mustang was assigned to the 155th Fighter Squadron. Ironically, the P-51D was not among the numerous aircraft that had been rumored for bed-down in Memphis. The 155th Fighter Squadron, which became known as the “Red Scarf Squadron”, was well known for its precision flying ability and was often sought after to participate in public events such as the Cleveland Air Races in 1948 and the 1949 National Air Fair in Chicago. In 1948, the newly-formed USAF changed the “P” (for pursuit) designation to “F” (for fighter). In January 1951 the 155th was called to federal service to prepare for missions in support of the Korean Conflict. Of immediate concern was the task of modifying its fleet of F-51 aircraft with photo reconnaissance equipment. On 1 April 1951, with all assigned aircraft now RF-51’s, the 155th was re-designated a Tactical Reconnaissance Squadron (TRS) and deployed to Shaw AFB, South Carolina. The 155th Tactical Reconnaissance Squadron returned to state control on 1 January 1953 and began night photo-recon operations from the Memphis ANGB with newly assigned Douglas RB-26 Invader (Intruder?) aircraft. The 155th flew the RB-26 for the next three years. On 1 April 1956 the 155th converted to the RF-84 aircraft. RF-84’s were brand new jet-engine aircraft directly off the factory assembly line. The 155th’s mission remained tactical reconnaissance for another 5 years. 1 April 1961 was truly a major milestone in the unit’s history as it marks the beginning of the 164th’s era of military airlift. It was on this date the 164th Air Transportation Group (Heavy) was activated as the parent organization, and the155th was re-designated an Air Transportation Squadron (Heavy). Other support units assigned to the 164 ATG were stood up as well. The gaining major command (MAJCOM) for the 164 ATG was the Military Air Transport Service. Lt. Col. William C. Smith was reassigned from the 118th Tactical Reconnaissance Wing in Nashville to the position of group commander. The organization received the Boeing C-97 Stratofreighter, a heavy military transport based on the B-29. This mission change was an exciting time for the Airmen of the 164th and the glamour of worldwide missions resulted in high morale among the troops. The USAF re-designated MATS to Military Airlift Command (MAC) on 1 January 1966. This resulted in a corresponding change to the designation of the 164th – it became the 164th Military Airlift Group (MAG). In January 1966 Air National Guard transport units began flying additional cargo flights each month to Southeast Asia. The 164 MAG was no exception. In fact, the 164th did more than its fair share. In May 1966 the 164th set many records for airmanship: Ten round trips to Southeast Asia, over 1700 flying hours, and tremendous transport of cargo and passengers–all accomplished by part-time personnel. May of 1967 brought the grand lady of the air, the C-124 Globemaster, as the 164 MAG converted aircraft once again. Affectionately known as Old Shaky, the 164th would continue to fly strategic military airlift missions in the C-124’s until May 1974. In September 1974 the 164 MAG took receipt of the first of nine C-130A aircraft and began another aircraft conversion. The mission remained military airlift but the focus was tactical in nature. The unit obtained a drop zone in Coldwater, Mississippi and performed its first aerial delivery mission on 8 February 1975. The 164th Military Airlift Group was re-designated the 164th Tactical Airlift Group. In the 1990’s Desert Storm brought the activation of several units of the 164th Tactical Airlift Group. One unit noted for its service was the 164th Mobile Aerial Port Squadron. This unit was the first Air National Guard aerial port unit activated for Desert Storm and served a six-month tour in the desert with distinction. After a one-year delay due to Operation Desert Shield/Desert Storm, the 164 TAG began a conversion back to strategic military airlift when the first of nine C-141B Starlifters arrived on 2 January 1992. For several months the unit flew both C-130A’s and C-141B’s. The 164th transferred its last C-130A in April 1992 and was re-designated the 164th Airlift Group. In October 1995, the 164 AG was re-designated the 164th Airlift Wing. This was a result of an USAF initiative to re-designate all unit-equipped flying groups, including Guard and Reserve flying groups, to wings. In late September 2001 the 164th volunteered on short notice to take over Air Mobility Command’s European Strategic Intra-theatre Deployment (E-SID) mission based at Ramstein Air Base, Germany. The unit deployed and flew its first E-SID mission within 40 hours of initial notification. Although some Airmen deployed for longer periods of time, most supported this mission on a 30-day rotational basis until December 2002. In April 2002 the USAF made public its plan to assign C-5A Galaxy aircraft to the 164th Airlift Wing in fiscal year 2005 (1 October 2004). The wing wasted no time and immediately began to pre-plan what could be, arguably, its greatest organizational challenge since its beginning in 1946. The 164th Airlift Wing retired the first of its nine C-141’s in November 2003. The final aircraft, tail number 70157, was retired on 2 May 2004 following a brief ceremony at the ANG Base. All unit-assigned C-141’s were handed over to the Aerospace Maintenance and Regeneration Center (AMARC), Davis-Monthan AFB, AZ to be taken out-of-service. The USAF’s C-5A iron flow plan for the 164 AW had the first Galaxy arrive in Memphis on or about 15 September 2004. Another was delivered prior to 1 October 2005.